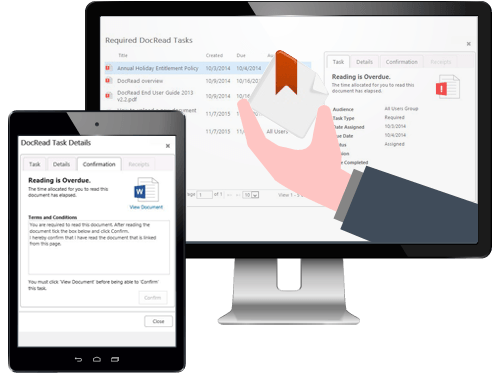 DocRead for SharePoint allows policies (or anything in a SharePoint list!) to be distributed, tracked and confirmed without leaving SharePoint. Combine the power of fast and accurate targeting with up to the second Reports and keep on top of the job of keeping staff up to date with ease. DocSurvey lets you check the level of understanding for a document or item you send. You can test, get feedback or just gather information using this versatile add-on to DocRead. Combine it with DocRead to create powerful compliance workflows or just use alone as your go to form solution. We are proud to have co-founded the SharePoint Community in 2007 and more recently Collab365. Our role goes from strength to strength as we continue to help build innovation and knowledge sharing with the community. If you are looking to make SharePoint work for you, look no further.